Annelids are segmented worms who benefit the earth in many ways. As a group they work the soil, letting oxygen in and removing dead and decaying matter, make nutrients more available in the soil and providing a food source for larger animals. About 9,000 species of annelids are known. The name annelid comes from the Latin word “anellus,” which means little ring. Annelids' bodies are made up of a series of essentially identical segments running from their heads to their tails. They lack lungs. Some have simple gills, and the rest breathe through their skins, a process that requires constant moisture. Even the simplest annelids have functioning nervous systems, complete with brains. They also have series of ganglia, one per segment, that assist them in controlling their bodies. Earthworms are probably the best known and most common of the annelids; more than 2,700 kinds of earthworms have been identified around the world. 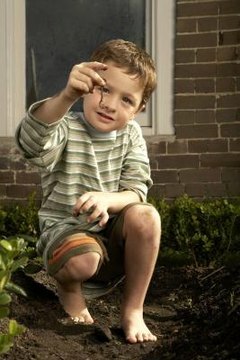 They range from no more than a half-inch long to many feet long; the largest recorded earthworm was 22 feet. Earthworms exist in great numbers anywhere the soil isn’t frozen; it’s estimated that a single acre of fertile soil holds up to a million earthworms. These coldblooded creatures are hermaphrodites, meaning each one is both male and female, and they reproduce by laying eggs encased in cocoons. Often feared for their reputation as bloodsuckers, leeches are another example of annelids common throughout the world. Most live in temperate climates, but some are found in other places, ranging from hot desert ponds to the icy waters of Antarctica. Some leeches feed on the blood of turtles and fish, but others never drink any blood. These leeches eat amphibian or fish eggs or other debris that would otherwise clog their homes. Most leeches live in water, but a few types are amphibious and can survive on land for short periods of time. The polychaetes are typically found in or near the ocean, consuming algae and other bits of food they find as they burrow through the sand. Members of this group of worms are typically covered with a large number of stiff bristles that are readily visible. Included with the polychaetes are bristleworms, lugworms, fireworms and clam worms. Many of these annelids spend the first part of their lives as free-floating zooplankton until they eventually develop into their adult form and begin life down in the sand.